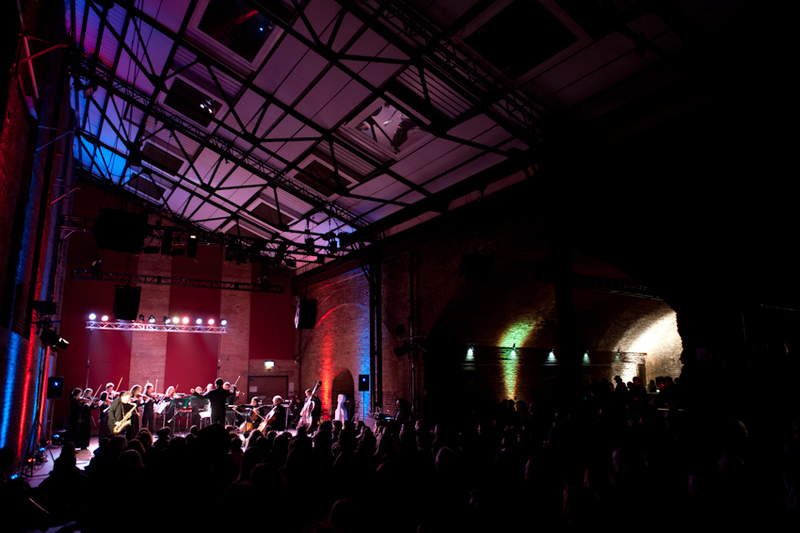 With no sign outside the venue, no visible advertising for events, Village Underground has a pre-calculated sense of attracting 'those in the know.' But once you're there, its cavernous space does have real atmosphere. The Spitalfields Music team have a strong mission to get music into unusual spaces, to get the right balance and make the experience work. Producer Rachel Shipp had done a superb lighting design to work with the building and to enhance the sense of occasion. Matthew Swann and Clark Rundell introduced the works, and making up for the facts that there was no printed programme, and that during the performance the house lights were so low you couldn't have read one anyway. Down to business then, the music... The piece which worked best in the space was the Georgian/ adoptive Belgian composer Giya Kancheli's (1935- ) Night Prayers from 1992 , with Tim Garland as soloist. It opens with taped voices and carries a very similar expansive-contemplative vibe to Gorecki's 3rd Symphony - the Zinman/ Upshaw recording of which was issued in the same year. I would take a wild guess that the short concert opener, Alfred Schnittke's playful Moz-Art à la Haydn from 1977 was written for the the short-lived dream violin team of Latvian master Gidon Kremer and his first wife Tatyana Grindenko. The leader of the CLS Alexandra Wood and Jane Carwardine were last night's characterful soloists, who dug into the eighteenth century pastiche lines with energy and bite. The piece had come out of quiet and darkness and had a real sense of theatre. The third work was four movements from Tim Garland's new Songs to the North Sky. He's talked about the piece in this interview. Orchestral percussionist Glyn Matthews produced a whole range of different timbres - Tim Garland's recent double concerto with LSO percussionist Neil Percy stays in the mind - and impressive bassist Markus Van Horn provided both a beautifully judged jazz-time foundation where required, and also anchored some of the folkier rhythms. Garland, on soprano and tenor saxes was eloquent soloist. A nice touch was Rundell's introduction of him, making comparisons with Bach and Mozart. (I think he said) "This is so rare in classical music to be there when the composer plays his own new music. Garland is indeed building an impressive collection of concertante works, the stylistic range broadening out as the works evolve. Last night there was a nice nod to the language of Michael Tippett. A final unaccompanied solo Ellington In A Sentimental Mood had just the right, rising five-note upbeat for Valentine's Day. This venue was a revelation to me. Especially due to the atmospheric and captivating music that night. Very impressed.